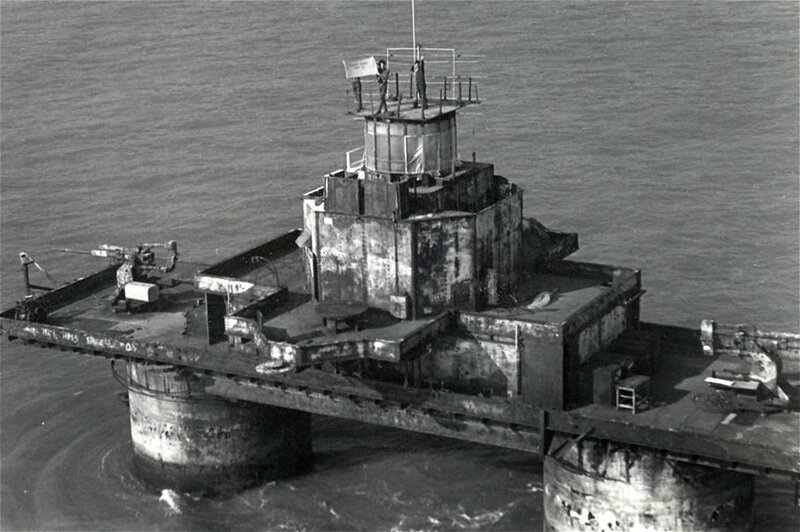 The offshore Maunsell forts, or towers, which interested the pirate radio operators of the Sixties, were originally World War II military facilities built to protect the coastal sea lanes and were essentially of two designs (click on the images to see original condition). 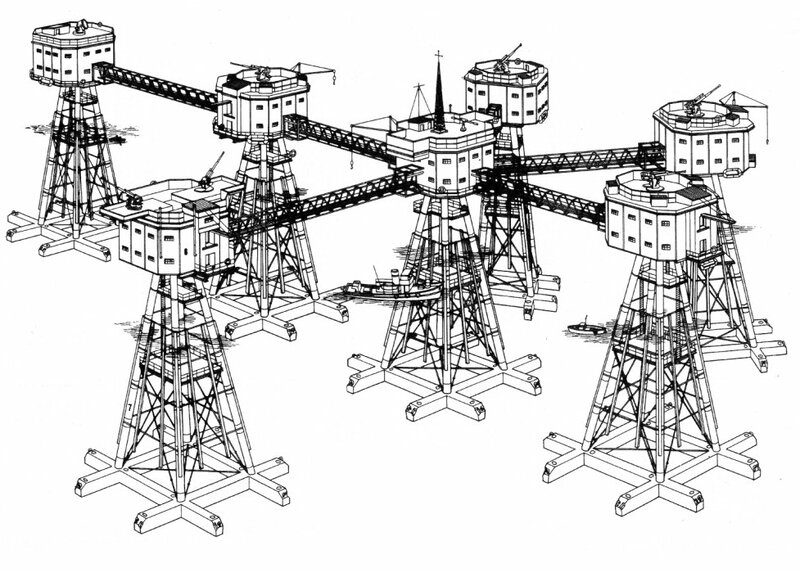 The Army towers looked like several square boxes on tripods, the catwalks connecting to form a partial circle with a 'hub' tower in the middle. Each box was about the sixe of a two-floor house with the lower floor used for operations and the upper floor for accommodation. 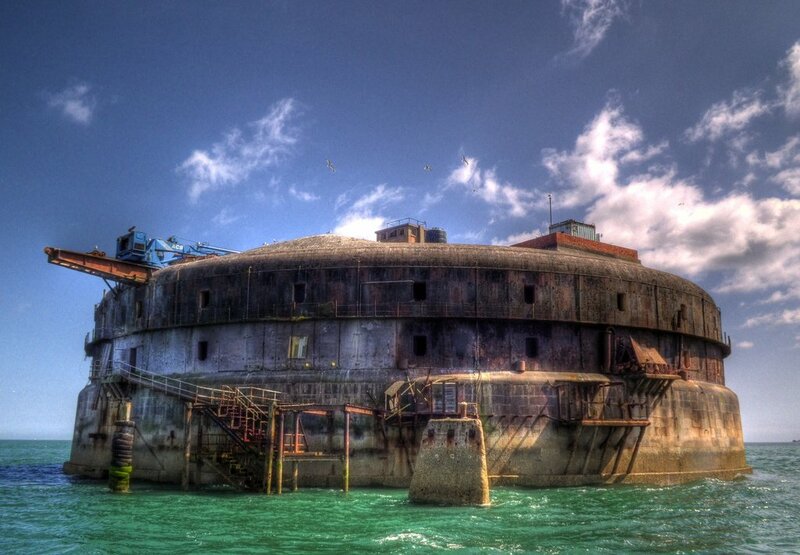 The Navy forts were more solid-looking single structures having the appearance of a 'ship on stilts'. 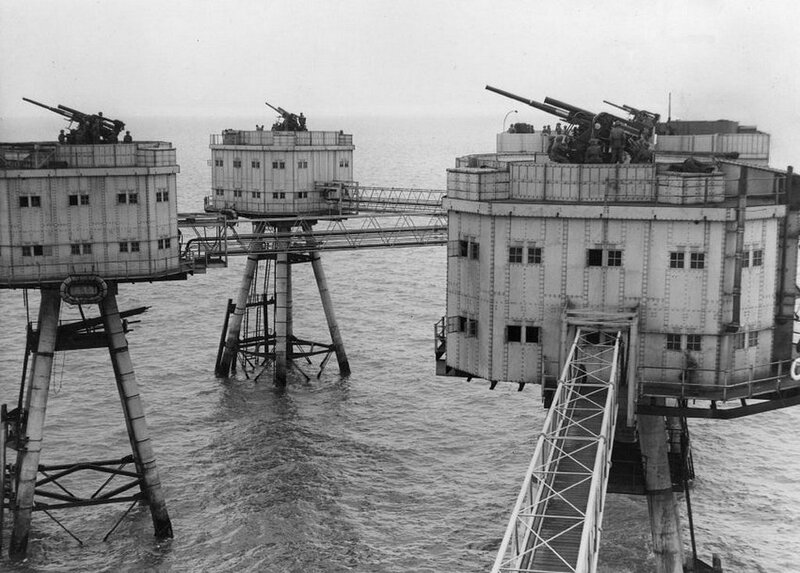 The 30ft diameter stilts supported a large platform on which were constructed a number of cabins (with a high 'lookout' in the centre) and the spaces at each end were occupied by anti-aircraft guns. 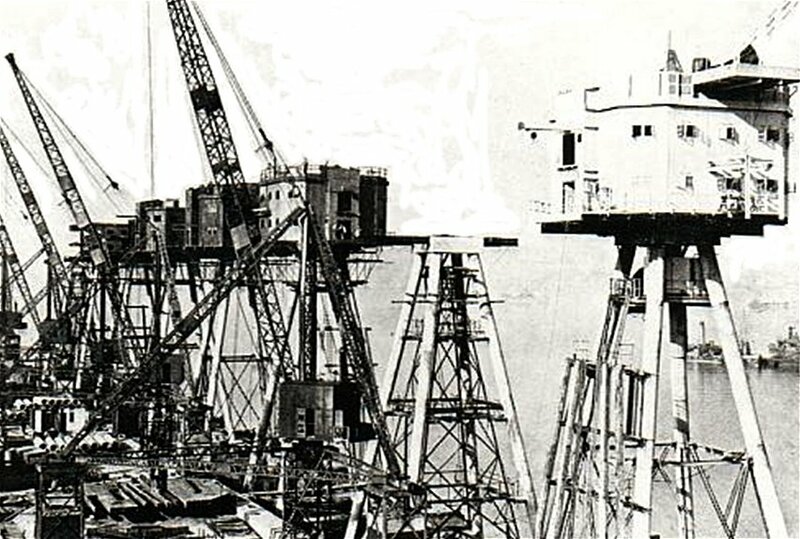 The 'stilts' were large round concrete legs sunk firmly into position on the sea bed and formed the accommodation of the facility as they were hollow and eight floors high, with all but the top couple of floors being below sea level at high tide. The floor areas were quite large, enabling them to accommodate about a dozen two-tier bunk beds around the wall. The space was originally designed for a complement of about 120 men. Each leg contained a lift shaft for moving ammunition up to the guns on top, and a stairway for the occupants. The top floor in each leg contained power generators and the bottom floors were for storage, holding ammunition in one leg and food in the other. 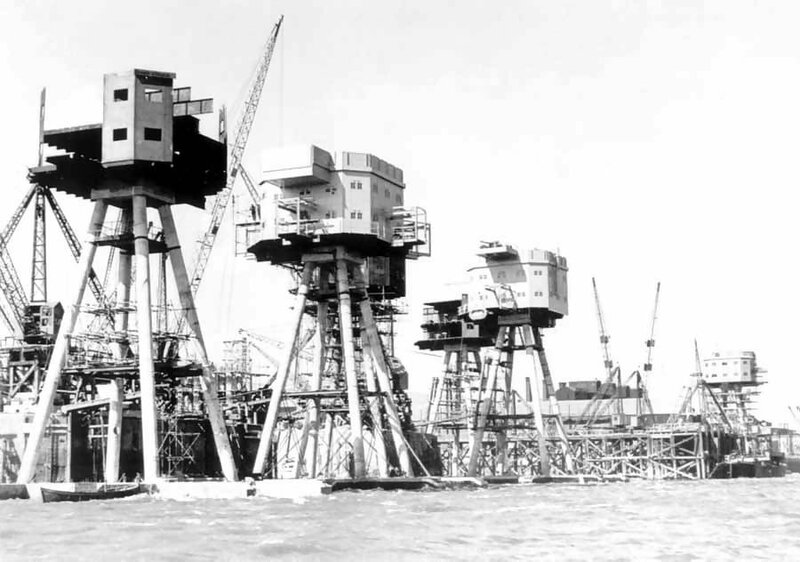 It is worth noting that a great variety of sea forts were constructed around the UK during WW2 but did not figure significantly in pirate radio activities either due to location (broadcast range) or non-existence - most were destroyed immediately after the war as they interfered with shipping lanes. Had they survived, it would have been interesting to see whether they would have attracted the interest of would-be radio stations. 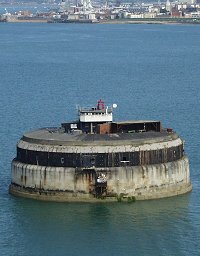 The attraction of the Thames forts was, of course, that they still existed and were perceived to be outside British territorial limits. Also, the transmission distance to the capital was considerably smaller, requiring less powerful transmitters. The Solent Napoleonic forts of various sizes, Spit Sand (Spitbank), Horse Sand, No Man's Land and St. Helen's, were also used in the second world war but had originally been constructed between 1861 and 1880 as part of a defence system against the threat of Napoleon and became known as 'Palmerston's Folly'. The chain of forts (on land and sea) runs all round inland Portsmouth and out into the Solent. 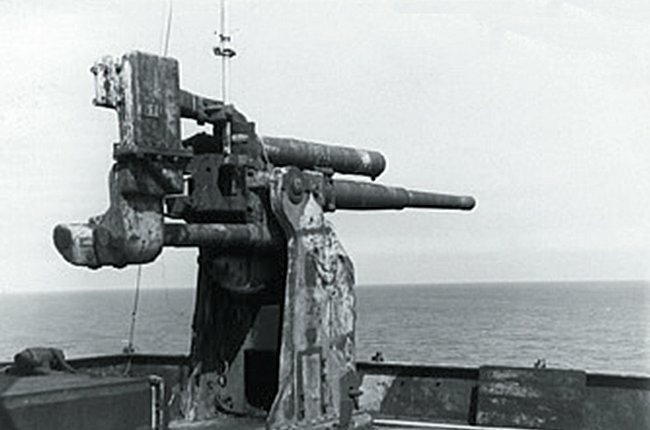 The original navy forts weighed 4500 tonnes and their armament consisted of two 4.5" guns mounted on the main decks, four Lewis machine guns and two Bofors 40mm guns on the upper deck with the central wood and steel tower supporting a radar scanner dish. Another curiosity is the 27-metre Nab Tower, situated on the Nab Rocks in the entrance to The Solent shipping channel to the east of Bembridge, Isle of Wight. 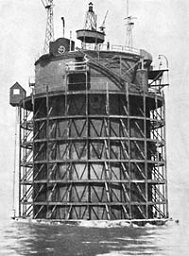 Two towers were originally planned to be constructed at Shoreham in 1918 for placement in the Straits of Dover to protect shipping from U-boats, but only one was ever completed, due to the ending of WWI. 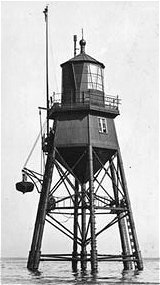 It was, instead, used to replace the Nab lightship and was put into place on 12th September 1920, in a similar manner to the later Maunsell forts (but ending with a 3-degree tilt!). The 'lighthouse' was manned until 1983. 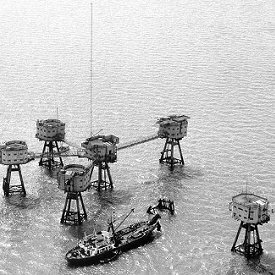 There were other marine structures in the Thames area at various times, including one thought by many to be one of the 'pirate' towers. 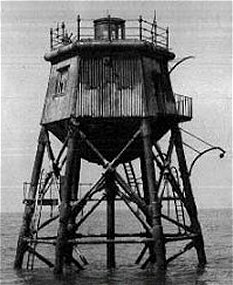 This was Gunfleet and, at 74 feet, was a kind of lighthouse looking like a water tank on stilts - not dissimilar to one of the single sections of the Army forts. It was constructed in 1850 as a screw pile lighthouse designed by Mr. Walker of Trinity House but based on the invention of an Irish man called Alexander Mitchell. There was a similar construction at Chapman Sands off Canvey Island until the sea finally got to it in the 1950s. 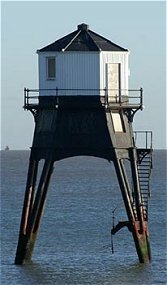 They are both somewhat similar in appearance to the shore-based constructions visible at Dovercourt on the East coast. The forts were not a popular posting and were abandoned wholesale by the military at the end of the war after which ownership became a matter of opinion as they were generally considered to be situated in international waters and not subject to any particular mainland jurisdiction. In fact, the War Office seemed to be rather keen to pass responsibility for them onto other government departments having tried, unsuccessfully, to sell them off in 1963. 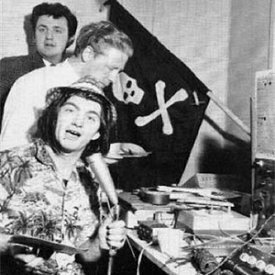 This didn't really matter, of course, as they were doing no harm and were of no real practical use to anyone - until pirate radio came along! ... and another debatable decision which considered sandbanks visible only during unusually low tides at certain parts of the year to be part of the British mainland, all of the towers, except Roughs and Sunk Head, were declared to be inside territorial waters and therefore subject to prosecution under the Wireless and Telegraphy Act. The area of water in the bay, 683 square miles as calculated by a Ministry of Defence naval surveyor, was only 5 square miles more than that inside the theoretical semi-circle! 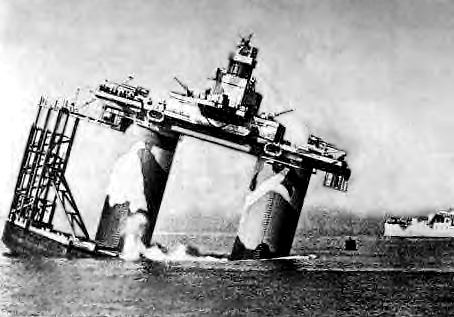 The last military maintenance teams were withdrawn from the towers in the winter of 1958/59 and by the Sixties all the offshore towers were already in a state of considerable neglect and disrepair, offering at best only a bare minimum of facilities and were to prove impossible to supply for long periods during bad weather. This is part of a description of Shivering Sands, which was the home of RADIO CITY - the fort had lost one of its towers when a ship ran into it, killing four people: ". . . one section had collapsed and another was standing all alone where the walkways had collapsed." Also, being in open sea areas and constructed largely of metal, they were natural lightning conductors. On Red Sands, D.J. Paul Beresford of RADIO 390 was actually struck by lightning, not only surviving but managing to broadcast his usual programme only hours later! Even on good days huge build-ups of static electricity were apparently a problem and there are many recounted tales of station staff being thrown some distance after carelessly grabbing metal door handles. 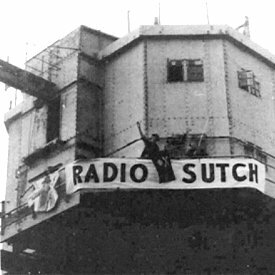 Minor things like that, however, didn't seem to be any deterrent to the more determined pirate radio station operators. 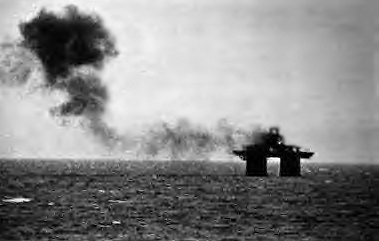 The planned final destruction of the towers commenced on 21st August 1967 when a team of 20 Royal Engineers demolished the upper sections of Sunk Head using 2200lbs of explosives, in front of a specially invited audience of television and press reporters, with a blast that could be seen both from the Radio Caroline ship and by Roy Bates on Roughs tower six miles away. 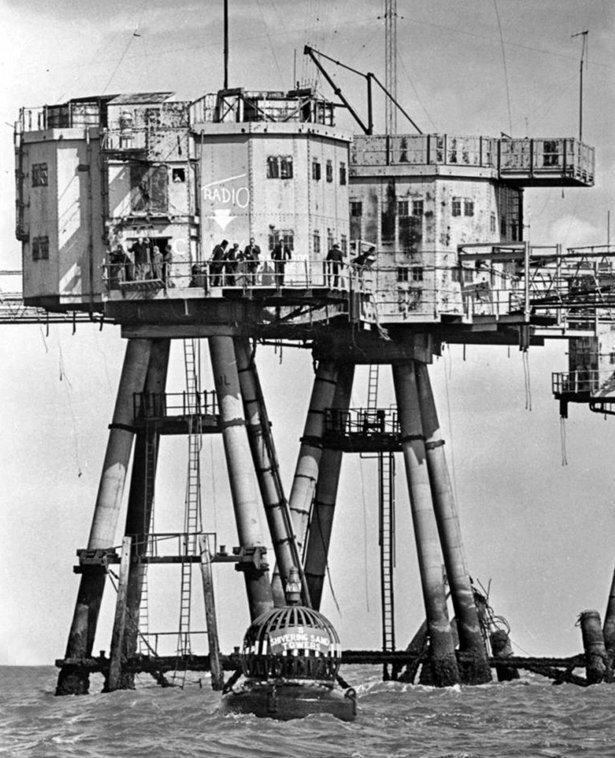 On September 2nd 1967, his wife's birthday, Roy Bates declared the Roughs platform, supported by 75ft concrete pillars, to be an 'independent nation' named Sealand and proclaimed himself monarch. The following year, the Royal Maritime auxiliary vessel 'Golden Eye' had three warning shots fired across her bow as she approached the structure, forcing it to return to shore. Roy Bates subsequently faced a summons under the Firearms Act but when he appeared in the dock at Essex Assizes the judge decided that the courts had no jurisdiction outside of territorial waters. In summing up, the judge remarked on “this swashbuckling incident perhaps more akin to the time of Sir Francis Drake”. Prince Roy of Sealand proclaimed the Constitution of the Principality on 25th September 1975. Gradually, items of national identity were produced such as the flag of the Principality of Sealand (red and black with white diagonal stripe), a national anthem, stamps and even its own currency - gold and silver coins designated as Sealand Dollars. 'Official passports' for the Principality of Sealand were issued to people who had, in some way, helped the birth of Sealand but were never at any point for sale. In August 1978, a number of Dutchmen employed by German businessman Alexander Achenbach arrived at Sealand, ostensibly to discuss potential business dealings. In Roy's absence they kidnapped his son Michael and took Sealand in a coup d'etat. 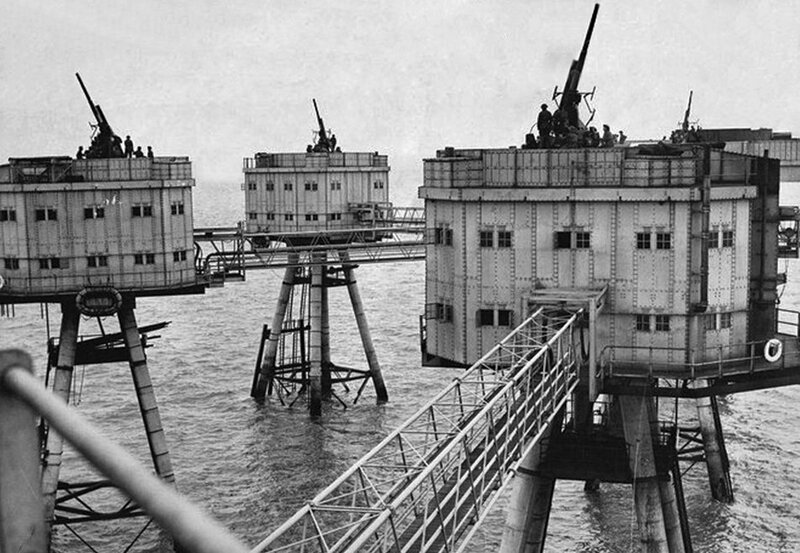 Roy recaptured Sealand with his own 'troops', by helicopter, and imprisoned the usurpers as prisoners of war, during which time the governments of both Germany and The Netherlands petitioned for their release. They did ask England for diplomatic intervention but were turned down, with the British government explaining that they made no claim on the territory and citing the court decision as reason for their refusal. 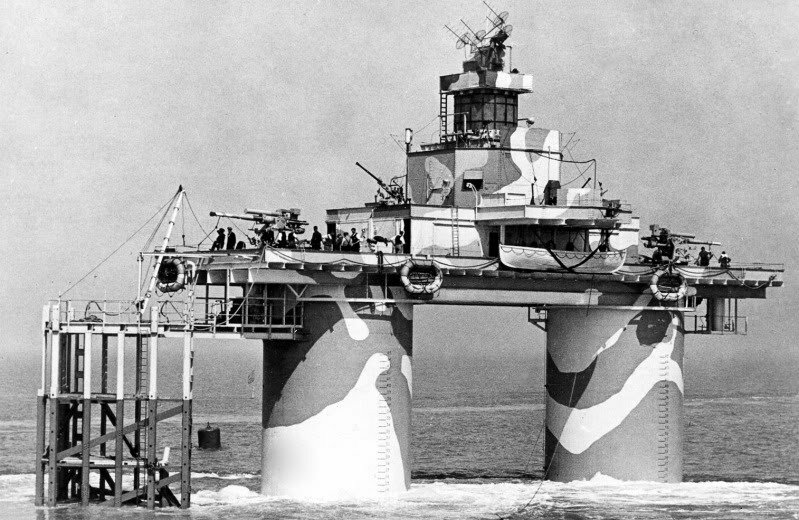 The others had no choice but to recognise Sealand's sovereignty and West Germany even went so far as to send a diplomat to negotiate for the release of the German 'prisoner'. The Dutch prisoners were the first to be released under the Geneva Convention which requires the release of all prisoners when a state of war does not exist. The sole German continued to be held as, at some stage, he had apparently accepted a Sealand passport and was technically guilty of the crime of treason. Prince Roy, in the interests of Sealand's reputation, eventually released the man without charge. 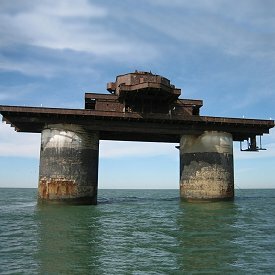 On 1st October 1987 Britain extended the limit of its territorial waters from 3 nautical miles to 12, but had been beaten to the punch by Roy who, the previous day, had declared his own extension of Sealand's territorial waters to a similar distance, including large areas of the Suffolk and Essex coast, to ensure that access to Sealand could not be blocked by British territorial waters. To date, no official agreement has been signed between Sealand and Britain regarding the resulting overlap in claimed jurisdiction but a general policy of dividing the area between the two countries down the middle has been unofficially followed. International law does not allow the claim of 'new' land by the simple extension of sea rights and so Sealand's sovereignty was still guaranteed. Under this law, neither 'country' can claim rights to any part of the nother that falls within its 'new' boundary and it is to its credit that Britain has made no further attempts to take Sealand but still treats it as an independent State. 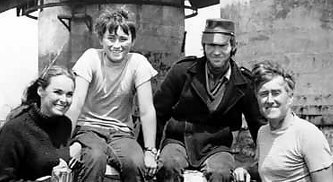 Following a ruling by the DHSS, Prince Roy pays no British National Insurance during the time he spends on Sealand. There was another incident involving firearms in 1990 when warning shots were fired at a ship that had strayed too near Sealand. The crew of the ship subsequently made formal complaints to the British authorities but, despite Britain's severe prohibition of firearms, the government chose not to pursue the matter indicating that the Home Office still considers Sealand to be outside their umbrella of control. During 1997, a number of forged Sealand passports started turning up across the world, some of which were apparently used to open bank accounts in various countries under false names. Less than 300 official genuine pasports were in existence therefore it was unlikely that the items would be detected as forgeries due to the fact that hardly anyone had ever seen one. The source was eventually traced back to the same the same German who had unsuccessfully attempted to take Sealand by force. He had created an unofficial 'Sealand Business Foundation' that allegedly sold over 150,000 fake passports before being found out, resulting in the curious facty that there are now probably 500 times as many forged Sealand Passports in circulation than official ones. Apparently, a large number of the passports were being sold to people leaving Hong Kong during the Chinese reoccupation for a dollar each. During early 2000 Spanish police brought action against criminals that had set up a website selling fake Sealand 'passports' which are suspected of having been used by illegal arms and drug-dealing rings. One of these fake 'passports' was also encountered by police investigating the murder of fashion mogul Gianni Versace. 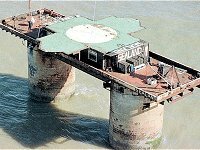 The current government of the Principality of Sealand states that "The Principality of Sealand recognises 'jus gentium' and has undertaken to regulate any activity with a view to compliance with 'jus gentium' and international law or to have it regulated." The acceptance and recognition of the Principality as an independent state, or country, has been demonstrated frequently over the last thirty years by both European and other States, but particularly Britain, which has stated unequivocably on a number of occasions that it has no jurisdiction within Principality territorial limits or that it takes no interest in events occuring within the jurisdiction of the Principality. In addition, many legal experts have carefully examined the arguments for and against Sealand sovereignty and have agreed with unanimity that 'jus gentium' applies as the basic principle of law supporting Sealand's independence. Due to failing health, Prince Roy reviewed the arrangements that had been in place for decades and, looking towards the future of the Principality, appointed his son, Prince Michael, the Prince Regent as 'Sovereign pro tempore' by Royal Decree in 1999. In June of 2000 an Anguillan-based company called HavenCo announced preliminary plans to locate its servers and satellite uplinks on the Sealand platform provided its independent status could be validated. The company planned exclusive leases of offices and operations centres in Sealand to users who wished to take advantage of its Internet colocation services. The purpose was to allow companies to use its servers to avoid the government scrutiny made possible by laws taken up by the U.K. and U.S.A. although HavenCo insisted that it would not allow any form of illegal trading. Sealand, of course, had no laws regarding the control of data traffic. To the dismay of many investors, the venture failed to become a a success. Ryan Lackey had moved to the fort in 1999, hoping to establish a safe location for privacy services such as anonymous remailers, and experiments such as anonymous digital cash. In a presentation to the 2003 DefCon convention, a former employee explained how internal politics and lack of investment had thwarted the venture. Contracts were broken, the bandwidth never materialised, and the location was vulnerable to DOS attacks. At the time of his presentation, HavenCo had failed to acquire any new customers and had, in fact, seen several of its existing customers leave. "Sovereignty alone has little value without commercial support from banks, etc," concluded Ryan. On Friday 23rd June 2006 the Roughs Towers top platform caught alight due to a fire caused by an electrical generator. "There is an awful lot of damage. It is worse than we expected. It is sortable, but there is an awful lot of smoke damage - it's got everywhere". 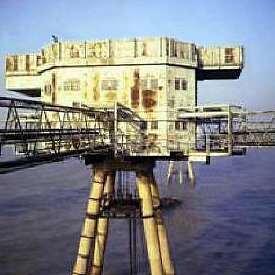 He was only able to reach the platform at the top of Sealand after his son James, 20, scaled it using a hook ladder. "It was very hairy, he was very brave and I am proud of him. Fortunately the winching mechanism is powered separately to the rest of it with a diesel engine, so we were able to get that working and get the boat up. I think there's about half a million pounds worth of damage. It is such a mess". Roy and Joan Bates had retired to Spain in 2006. Their son Michael, the “Prince Regent” and acting head of state since 1999, had opted for the terra firma of Essex, leaving the platform in the hands of a lone caretaker. With Michael having appointed his own son, James, as Prince Royal, Sealand remains one of the few micro-nations to have established a viable dynasty.